Essentially what that shows us is that Islamic terrorists were responsible for 6% of all the terror attacks. 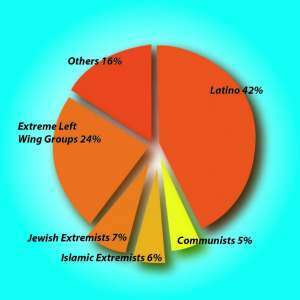 Or in the reverse terminology, 94% of terror attacks were undertaken by Non Muslim terrorists. So I was quite amazed to see Peta Credlin conduct an ill considered and blatantly racist or anti Islamic article in The Sunday Times this week with no basis of fact troubling her analysis. Let’s examine a few of her comments. And so it went on. Let me preface my remarks by saying that if I wanted to find out what Islam was about, I do not think that Ms Credlin qualifies amongst the top 5 billion people that I would consult. Likewise it is unlikely that I would approach someone of Catholic faith or Hindu faith to comment on issues of Judaism. Further, I am not a person of Islamic faith myself but am happy to count myself as a very devout atheist. It must also be said that Ms Credlin’s article was ill timed, having come a day or so after the brutal murder of Jo Cox in Britain. And we now know that a connection to the Neo Nazi Britain First group is being examined. The comments of the murderer publicly and the plethora of offensive material in his possession clearly implicate that group in his acts of violence. The question that immediately comes to mind relates to the complete lack of outcry by ANY of the Western, Anglo Celtic leaders of this barbaric and clearly terror related group. Where is the same condemnation that Credlin calls for from and about the Islamist leaders? Again, let me emphasise that Credlin’s name does not leap to my mind when I look for advice on military intervention in the Middle East or anywhere for that matter. But let us also look back at the “success” of the campaigns in the Middle East over many years. The deaths of innocent civilians as well as massive losses of military personnel will continue to rest on the shoulders of every one of the supposed “leaders” who have undertaken the sort of campaigns that Credlin is suggesting. Why would we even want to escalate this further? And should we not also examine whether the “Islamist terrorism” that Credlin is paranoid about has actually been created by our unauthorised and inappropriate intervention in the region? The issues of terrorism, radicalisation and related matters are very vexed ones. What is needed to ensure that we do not create an environment for these issues is a programme of integrating communities to achieve a sense of belonging and harmony. Suggestions such as those proposed by Credlin and her former Prime Minister, Tony Abbott are completely counterproductive and will in fact achieve exactly the opposite. It will create elements of further discontent amongst the migrant communities and will lead to feelings of disenchantment and disenfranchisement which is a perfect breeding ground for elements of terror. And that breeding ground is not culturally or religiously specific. The potential for this occurring in any community is high. And we must guard against simplistic and volatile solutions as proposed by Credlin and her ilk.